Chaga is much different than other mushrooms. It has been evaluated an identified as one of the richest natural sources of Anti-Oxidants available. Chaga grows on Birch Trees in climates with extreme cold winters and hot summer months. Chaga is naturally occurring as a result of the tree being under attack from harmful fungus -- Chaga takes several years to form once a tree is in distress. Chaga has been used for centuries by people all over the world ~ throughtout the Northern Hemisphere. Here in the U.S. Chaga is found in some abundance in the Upper Northeast and Northwest Regions. There are many different applications and uses for Chaga taken orally as a Chaga Juice-Tea, some customers turn Chaga into their own tinctures for a variety of topical uses from soaps to ointments. In Siberia, the custom is to grind Chaga into a fine powder and mix into their food before serving. Here we will focus on doing a very simple extraction by simmering our Wild Chaga Mushrooms in water producing a Juice-Tea. Some people, for convenience like throw ithe Chaga Juice-Tea into juice and smoothies. The flavor is rather weak, and won't alter the taste of whatever it's being combined with. Where does our Wild Chaga come from? Our Chaga comes from forests here in Massachusetts. Here at Berkshire Grain we collect small quantities of Chaga, which is dried within 24 hours, chunked and packaged. We do not wholesale and warehouse Chaga for several months at a time ~ Our packages contain enough Chaga for approximately 4-6 weeks. We think this insures that the Chaga you receive from us is of the best quality available. Shipping is always free! 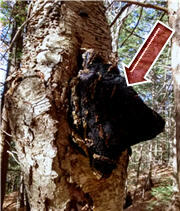 Here is an image of Chaga we recently harvested in Western Massachusetts. Chaga is naturally occurring on several varieties of Birch Trees. Everyone is familiar with White Birch Trees, however we prefer Chaga from the variety of Birches with the "Silvery Bark" for it's higher quality and concentration of nutrients. Before we go on ~ a quick word about "respect and sustainability". As you may already realize ~ naturally occurring, means just that ~ Like many things found on our planet -- there is no endless supply of Birch Trees and Chaga. In recent years we've been witnessing many inexperienced people going out into the woods and think nothing of "trophy hunting" Chaga. We call it this because often people will bring the Chaga home and not properly handle it or worse yet......just forget about it ~ what a waste. Even more commonly we find trees where all the Chaga has been removed leaving the Tree in a critical state, and the time it takes for Chaga to re-occur is too late. A trained forager will know how to safely remove the Chaga and leave Chaga behind for the Tree to survive. The following reference an Interview with Cass Ingram MD goes into some depth of scientific and medical explanations of how Chaga works in our bodies -- we strongly suggest you read the article. How to prepare Chaga Juice/Tea. It is our experience that both methods are effective. * tip: a funnel lined with a coffee filter helps if you didn't use a Tea Infuser. Save the just used Chaga pieces in a container to use a 2nd time. You may choose to save all the twice used Chaga chunks, and use all at once to brew one last 1/2 gallon batch of Chaga Juice.